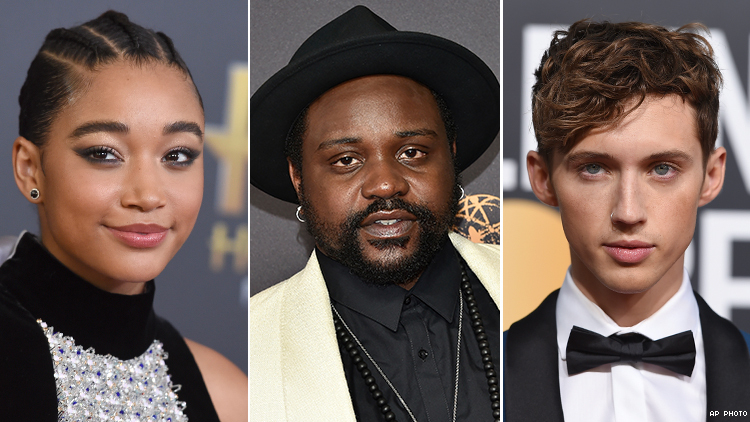 From Amandla Stenberg and Brian Tyree Henry to Troye Sivan. When it comes to the Academy of Motion Picture Arts and Sciences recognizing the best of the film industry, there is such a thing as right and wrong. Tuesday morning’s announcements, made by Tracee Ellis Ross and Kumail Nanjiani, are proof if there ever was any. Because though we’re all applauding the honors bestowed upon Mother Monster, there are some other performances and films that deserved to be recognized by the most prestigious voting body in Hollywood. I’ve said it once, and I’ll say it again: Brian Tyree Henry was one of Hollywood’s most valuable players this year. From Spider-Man: Into the Spider-Verse to Widows to White Boy Rick, the Morehouse and Yale graduate has been hustling! But his 12-minute role in If Beale Street Could Talk deserved a nomination. The depth. His emotional range. His eyes! I know it may sound absurd to give a teen movie an Oscar nomination, but Amandla Stenberg, as a teen who witnesses the death of her best friend at the hands of a white police officer, delivered one of the best on-screen performances of the year — of any gender — in George Tillman’s The Hate U Give. And Russell Hornsby’s turn as her father was career-making. No other film this year impacted me as much as this. The single best part of Beautiful Boy is Chalamet’s performance as Nic opposite Steve Carell. With all due respect, it’s leaps and bounds beyond his Oscar-nominated Call Me by Your Name performance last year. You probably haven’t seen the South Korean psychological drama mystery Burning, but when I tell you Steven Yeun’s performance is marvelous, I need you to believe me. It’s the Walking Dead actor’s first Korean-language role, but he’s a master. Though critically acclaimed, it didn’t get any love with from the film academy. How do you have the chance to ensure Dolly Parton graces your stage and you don’t take her up on the offer? Sure, the song isn’t amazing, but it’s Dolly Freakin’ Parton! Let’s add the film academy to the long list of people who obviously didn’t see Widows. That’s the only explanation for passing over Steve McQueen’s intellectual heist thriller starring Queen Mother Davis opposite a fabulous Cynthia Erivo, Michelle Rodriguez, and Elizabeth Debicki. This is disrespect on the highest levels. I’m not one for horror movies, and they always get the short end of the stick in Hollywood. But from what I could see on the large screen through my fingers, Toni Collette deserved to be in the leading actress category. There was once a moment when we thought the conversion therapy drama Boy Erased had a solid chance to go the distance for awards season. While that fizzled out in December, Sivan’s “Revelation” from the picture’s soundtrack was it’s only hope after nabbing a Golden Globe nomination. But the film academy told it all, quite definitely, to sashay away. We can’t completely say that Black Panther was shutout, but I will go on record and say it deserved even more recognition than it got. Coogler should’ve been in the directing category for the feat he accomplished, for his leadership and vision that gifted us the highest domestic grossing movie of 2018. Not one woman was nominated in the best director category. While there were countless to be considered, Heller deserved recognition for the stellar, now-Oscar-nominated performances she drew out of Melissa McCarthy and Richard E. Grant.